Update 11/5/10: Pivovarov has been released and his sentance annulled per court order, after a judge pointed out that his rights as a defendant had been violated. Among others, the activist was denied the right to choose an attorney and the police officers who had detained him were never identified. Courts and law enforcement agencies are currently deciding the fates of three opposition activists who helped to organize a rally in defense of free assembly in St. Petersburg this past Sunday, Kasparov.ru reports. Andrei Dmitriev and Andrei Pesotskov, both members of the Other Russia party, were detained at a rally at Gostiny Dvor as part of the Russian opposition’s Strategy 31 campaign. The two were charged with organizing an unsanctioned rally and disobeying a police officer, and were sentenced the next day to 5 and 14 days of administrative arrest, respectively. Following their sentencing, both Dmitriev and Pesotskov’s apartments were raided by police. A St. Petersburg court acquitted both men on Wednesday morning, but authorities followed to file a criminal suit alleging that the two participated in “extremist” activity. The Center for Extremism Prevention, commonly referred to as Center “E,” is a branch of federal Russian law enforcement that is charged with investigating what is deemed to be “extremist” activity. Human rights organizations around the world have criticized the center for torturing criminal suspects and other abuses of authority, particularly against opposition activists, and for its broad definition of what constitutes extremism. A harsher sentence was handed down to Andrei Pivovarov, leader of the St. Petersburg branch of the Russian People’s Democratic Union and another organizer of the October 31 rally. Pivovarov was arrested at Gostiny Dvor together with Dmitriev and Pesotskov. On Monday, he was sentenced to 27 days of administrative arrest for organizing Strategy 31 rallies in August and October and for disobeying a police officer. Originally, this same judge had sentenced Pivovarov to 14 days of arrest for his organization of the August 31 rally, but the oppositionist was released after two days of protests in support of his release. An appellate court ordered the case to be reviewed, and, as it turns out, Monday’s verdict is partially the result of that review. Opposition activists have spent the past two days staging protests calling for Pivovarov’s release. In Moscow, Solidarity leaders Ilya Yashin, Sergei Davidis, and Mikhail Shneyder held solitary pickets – the only type of protest that doesn’t require government sanction to be held legally – while Solidarity leader Boris Nemtsov joined in ongoing pickets in St. Petersburg. 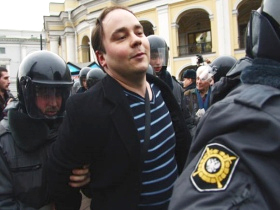 The group plans to continue protesting so long as Pivovarov remains under arrest. Two separate Strategy 31 rallies were held in St. Petersburg on October 31. One at Gostiny Dvor was attended by approximately 1000 people, by organizers’ estimates. Police began arresting the demonstrators immediately after the rally began. According to St. Petersburg police, only about 120 people came out to the rally, 104 of whom were detained. A second rally at Dvortsovaya Square was attended by about 300 people. Police began detaining activists after they unfurled a 30-meter Russian flag. Other rallies in the Strategy 31 campaign were held on Sunday across the country, including in the cities of Moscow, Vladivostok, Kurgan, Penza, Murmansk, Tver, Ekaterinburg, Samara, Astrakhan, Sochi, Ryazan, Krasnodarsk, and others.